GA doesn’t mean to lie, of course—not most of the time, anyway. But when they hide information, misclassify information, or flat-out fail to measure information but make you think they have, the effect is the same. You’re left with a woefully inaccurate picture, and you’re bound to make some woefully off-target decisions as a result. Wouldn’t you like to ditch the lies? To know what your analytics are really telling you—and what they’re not? And maybe how to fill in the gaps? 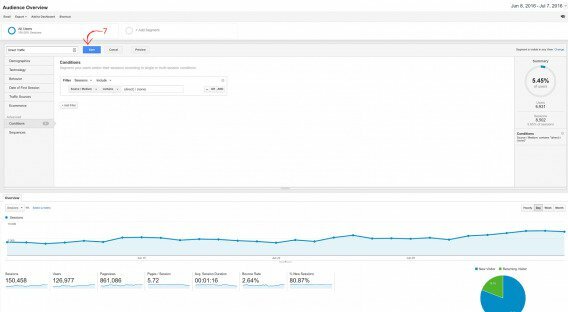 Well keep on scrolling for seven of the most insidious ways Google Analytics could be steering you wrong, and a few tips on setting things straight. This first GA lie is actually a lie of your own making, but it’s difficult to avoid. Presumably, you check out your own site pretty often…and if you’re not, you should be. Chances are you have a few team members heading to your site and every now and then, too. During redesigns and other updates to your website, your number of visits per day might reach into the hundreds. Each time you integrate with a new tool, add new social media buttons, and make other changes to your site in an effort to get more traffic and more conversions, you are likely to check your site more frequently. This can give you a “false positive” blip that seems to indicate your efforts are paying off far earlier than expected. Regular daily visits made by you and your team can also inflate your overall traffic numbers, and if your team is all nearby your local numbers will be artificially high, as well. If your daily visitors number well into the thousands these blips shouldn’t stand out too much, but for others they can cause big swings. The simplest fix is to set up IP filters to see what your GA data looks like with your computer’s site visits taken out. If you have a team that works out of a local office it will be easy to filter you their IPs, too; if you frequently use web-based contractors it can be a little more difficult, for both technical and human reasons (i.e. it’s harder to get outsourced contractors to do things consistently). Just know that spikes during redesign and update rollouts probably don’t mean much. There are a few ways GA gives you trouble when it comes to accurate attributions for your social media traffic. Some of them are easy to address, others are damn near impossible, but knowing about the problems allows you to better interpret your data. Many redirects and apps strip away referral tags from links, so when your audience lands on your page GA has no way of knowing where they came from—it ends up looking like direct traffic, which is just how Google Analytics reports it. The obvious solution for the redirect issue is to eliminate redirects between your social media sites and your content as much as possible. If you have third-party software like Salesforce or Infusionsoft, you’ll want to see how their analytics match up to what you’re seeing on Google Analytics – they might not be passing attributions through properly. There isn’t much to be done for mobile apps just yet, but Google and others are working to better integrate apps with the “traditional” web, so keep an eye out for changes in this area. Shared social is tricky. When someone sees your content on social media, clicks through to your site, and likes it enough to share the link directly—via email, chat, or even their own social media page in some instances—the attribution is lost. And yet again, GA will read this as direct traffic. Why are you doing all of this? Well, chances are these folks came through a shared link that you can attribute to “social” in one way or another. Services from Simply Measured, Chirpify, and social media management platforms like Hootsuite promise to provide better social media attribution than GA, just keep in mind there’s no perfect solution for capturing data on all of your “dark social” traffic, and this filter can help you get a better grasp of social’s true power. It’s not just for emails and comment sections anymore. Some unscrupulous SEOers will now plague your site with fake referral traffic from other sites, with the hopes that your published site index and Google’s own measures of your site activity will give them some added authority and an SEO boost. I’d bet a few million bucks that Google is hot on the trail of these “ghost” referrers, if they haven’t laid a secret smackdown already – so you don’t have to worry about being blacklisted yourself. While you probably won’t get penalized, it will give you inflated traffic numbers when you get hit. You won’t be hit consistently, either—ghost spam tends to come in spikes that may last a few days then fall back to a steady level of background noise, only to return again a few months down the line. If one of those spikes coincides with a new marketing push, you could easily get the wrong idea. The simplest fix is just checking your referral traffic sources any time you notice an uptick, whether it’s a spike or a steady climb. 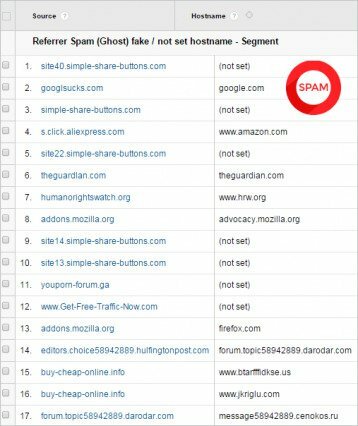 Doing this is Webmastery 101, of course, but to weed out the ghost spam you need to specifically look for a list of known ghost spam URLs or hostnames that are either missing or clearly fake. You can create a filter that only allows good domain names through, but that runs the risk of missing legitimate new traffic that you haven’t added to your list of approved referral sources. 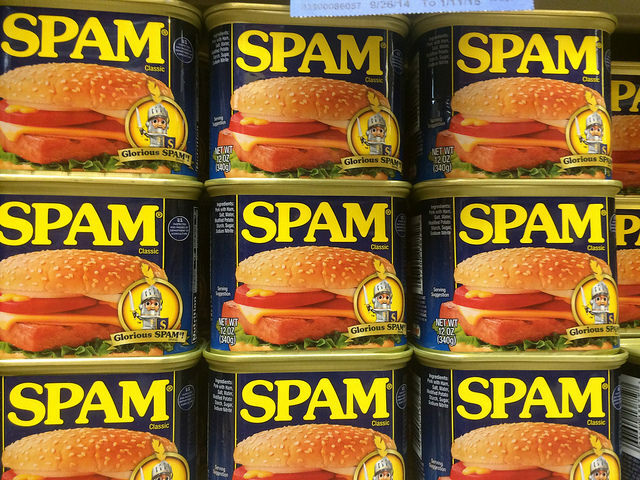 You can also create a filter that keeps out the ghosts, but unless you’re a GA wizard (or have the resources to hire one) identifying and filtering all ghost spam is going to be a time-consuming and often ineffective chore. Until Google comes up with something better, these partial solutions are the best you’re going to get. Again, though, being aware of the issue is a big step in the right direction, and will let you interpret your analytics info better even if you can’t get better analytics info. Remember all that social media traffic that got lost and ended up being reported as direct traffic? Well, GA does that to any traffic it can’t otherwise attribute, which can launch your direct traffic well beyond your organic traffic and any other channels you have set up but not properly tagged and traced. It’s frequently for the same reasons, too. Redirects between clicks and content are a common culprit, stripping away medium tags and other attribution so Google doesn’t have a referrer to count on. This can make everything from your email and paid ad campaigns to your organic search traffic show up as direct traffic in your GA dashboard. The solution, again, is to remove redirects or ensure referrals are passed through on every channel you can control. Most email marketing platforms like MailChimp and Campaign Monitor will integrate links with your GA, for example. Here’s MailChimp’s guide to integration; other platforms have similar how-tos or you can add GA metadata to your links by adding the right UTM tags to your in-link emails. 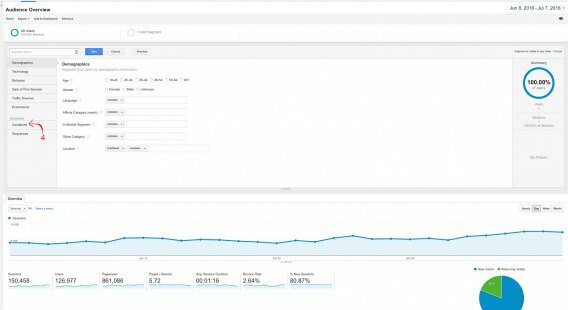 There are five UTM tags used by Google Analytics, and you can add them to any link you’re creating to help track your traffic sources. The “medium” and “source” tags are required, and it’s also recommended you add a “campaign” tag so you can associate each inbound visitor with a specific marketing endeavor. You can also add a “content” tag that allows you to differentiate between two content versions (for A/B testing) and a “term” tag to identify paid search terms that led to clicks. You can also use Google’s URL builder to add the tags for you, if typing it all out is a nuisance. Use the UTM-tagged URL for the links you drop in your email, and GA should track these tags across most email clients and any up-to-date email marketing platform. Mobile email apps are still tricky, though, and there will always be snags in maintaining attribution from every source. So what can you do? Interpret better! It’s all about approaching your data with a critical eye. You just launched a new paid as campaign and see a minimal uptick in that channel but a big spike in direct traffic? Odds are you’re seeing unattributed paid ad clicks. Just sent out a new batch of emails and don’t see any referral traffic but lots of new direct hits? Check with your email platform to make sure attribution is being properly handled. You’d think Google would have mastered search attribution by now, but it’s harder than it looks. One search may lead to another and another as the searcher continues to refine their query, and it’s only that last search—the one that actually leads them to your site—that GA records. Berlin street food → Berlin street food Turkish → Bistro Street Food → click to website. Chances are you have a fair amount of traffic that started off as a generic search but is being reported as a “branded” search—one containing your name or your site/business name. Searching for your name means they learned something about you from a generic search and wanted to learn more, which is awesome. What’s less awesome is you don’t know what generic searches they used or what their information source was, so you’re missing out on some valuable knowledge. And you’re seeing branded searches outranking more authentically organic searches that don’t include your name, which can be worrisome. The good news is you don’t need to worry too much. If branded keywords are driving a decent amount of traffic and unbranded searches aren’t too far behind, you’re doing alright when it comes to search (though there’s always room for improvement). The bad news is you can’t get back the information you lost. The best you can do is guess where customers are learning about you based on referral links and other recent mentions on other sites, then seeing what keywords those sites rank for. There are tons of tools from folks like Moz and more niche providers like Ahrefs that make it easy to see when and where new backlinks to your site are going up, and to see what search terms the pages linking back to yours are ranking for. Compare this to your own site’s rank for those keywords and you’ll have a better idea of how much unbranded organic search traffic you’re picking up, and where you can improve to be top of the SERPs. 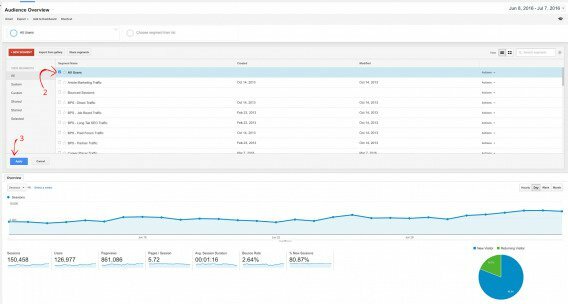 Google Analytics makes sure you see every click made on a paid search ad—that’s money in the bank for them, and they want you to see it’s working. They’ve also made Paid Search the default channel for any links that are tagged as CPC or PPC, which most of you probably use for your pay-per-click advertising on social media. It’s not your fault. Your social ads are pay-per-click (or pay-per-view), so it makes sense to label them as such. But GA gives the credit for these clicks to paid search unless you clear things up with a custom channel. Creating a custom channel is easier than it sounds. The only tricky part is remembering to add all of your future paid social links to that channel, otherwise they’ll either slip through the cracks entirely and be read as direct traffic, or they’ll go right back to being reported as paid search successes. This image breaks it down neatly step-by-step. 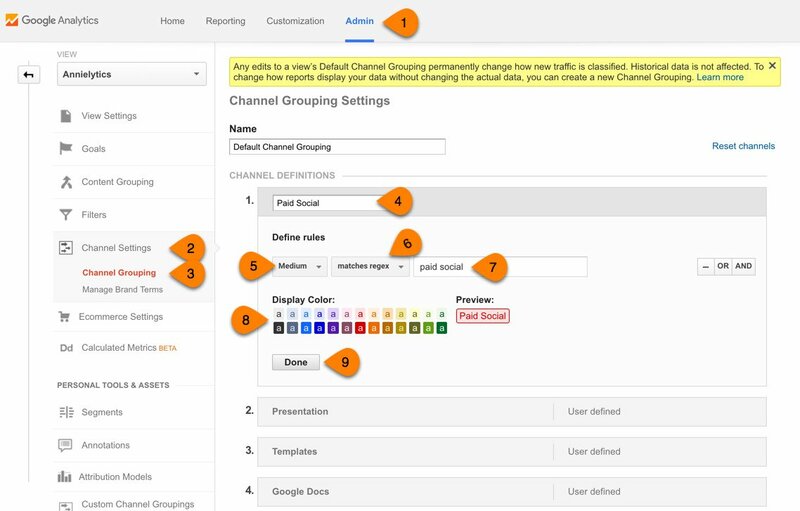 Go to your admin panel, head to Channel Grouping, and make a new channel definition (you can call it whatever you want, but Paid Social is nice and straightforward). Define a medium tag (again, “paid social” works pretty well), pick a color so this channel stands out, and you’re good to go. Just as user behavior can cause misleading keyword stats, it can also cause your GA dashboard to show a ridiculously high cost per conversion rate on your CPC campaigns. When you only see one or two conversions on a $500 ad spend, you might be understandably upset. But did you see an increase in sales from other sources around the same time as your campaign went up? 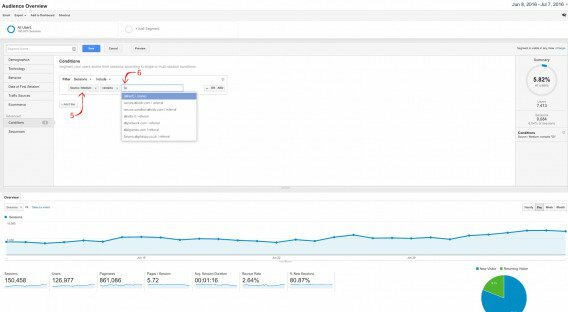 You’ll want to attribute at least a portion of those conversions to your CPC campaign, too, even if Google doesn’t. A bunch of customers saw your paid ads. They didn’t click, but they were intrigued. Maybe the did a search, maybe they went start to your homepage, maybe they looked you up on social media, but eventually they decided to buy something. And it all started with your paid ad, even if your ad didn’t get the credit. Yet again, there’s no way to measure this kind of paid advertising success directly. You’ll have to look at increased traffic flow from other sources that coincides with a new ad campaign or increased spending—if you see a correlation, there might be some causation. In short, the best thing you can do to keep Google Analytics in line is cut down on redirects, track everything you can, and use the information you have to make an educated guess about the information you know is missing. That, and keep your eye out for better analytics platforms that deliver where Google is weak. From your own team’s inadvertent traffic skews to Google playing fast and loose with PPC and paid search attribution, from the direct traffic catch-all to the inflation of your branded search success, the pitfalls of Google Analytics are everywhere. Is it worthwhile for you to invest the time and resources to capture your hidden social data and reign in your ghost spam? That’s a question every online business owner needs to decide for themselves. There’s no question that you need to know where the problems lie, though. Get to know the data devils you’re stuck with, and it’ll be harder for them to lead you off the right path. This article originally appeared in ConversionXL. This article was written by Joshua Bretag from Business2Community and was legally licensed through the NewsCred publisher network.